ItemI-52276 - "A ploughing match at Chilliwack, Fraser Valley, British Columbia". ItemI-52277 - "Typical small fruit farm in the Fraser Valley, British Columbia"
ItemI-52282 - "A strawberry field at Keatings near Victoria, BC". ItemI-52283 - Annie Turner, 11 years old, with her triple prize winning steer, Kamloops, BC. ItemI-52027 - "Provincial government demonstration apiary at Huntingdon. Averaged 120 lbs of honey per hive in 1925. Matsqui, BC." ItemI-52028 - "Belgo orchards, Vernon". ItemI-52073 - "General view from above dam, looking south", 1-sluice dam; 2-intake site; 3-powerhouse site; 4-flume to provisional power plant; 5-construction camp; Stave Falls power project. ItemI-52585 - "Gate-house or intake of Coquitlam-Buntzen powerhouse No. 2, Vancouver Power Co."
ItemI-53866 - "Nanaimo Dam construction, 17th Jul 1931", No. 15. Item I-52027 - "Provincial government demonstration apiary at Huntingdon. Averaged 120 lbs of honey per hive in 1925. Matsqui, BC." 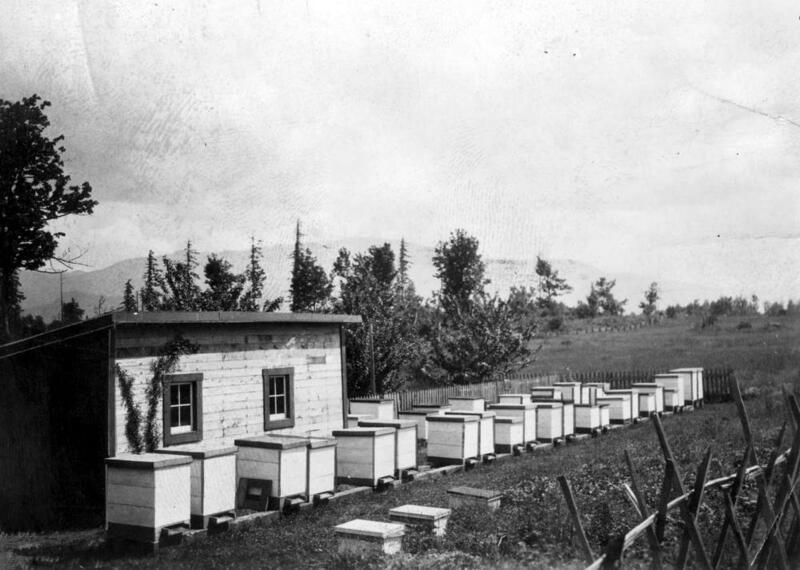 "Provincial government demonstration apiary at Huntingdon. Averaged 120 lbs of honey per hive in 1925. Matsqui, BC."